Built-Up Roof systems can be made out of several layers of mats, fabrics, or felts reinforced with bitumen (either coal tar pitch or asphalt). The roof surface can be covered with a gravel application, a weather resistant coating or a mineral cap sheet to preserve the felts and bitumen from premature weathering. 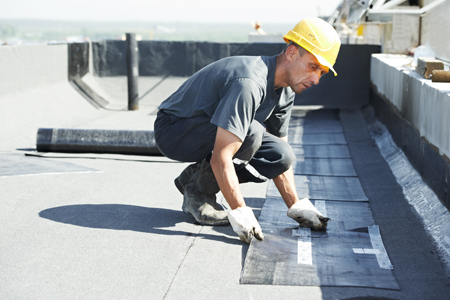 Because of the highly dependable service it provides, BUR is one of the oldest (120 years old, to be exact) low-slope roof systems still used on commercial roofs today. Its track record in the roofing industry is unmatched. Today, it still provides building owners with dependable service. We are experts at installing Built-Up Roof systems and Modified Bitumen as well as analyzing the performance characteristics related to these systems in order for us to come up with the right roof system fitted to the conditions existing in your building. Modified bitumen roofs are often made of asphalt reinforced with either fiberglass or polyester. These types of roofing systems are an integration of modern and traditional roofing technologies. There are two different polymers made used in Modified bitumen roofs: Atactic Polypropylene (APP) or Styrene Butadiene Styrene (SBS). They modify the membrane resulting in better temperature flexibility, and enhanced elasticity. The polyester fiberglass that strengthens the roof system makes the system stronger and more resistant to punctures. It is often installed in multiple layers to give it a multi-tier protection system from wind uplift, extreme temperatures and water. 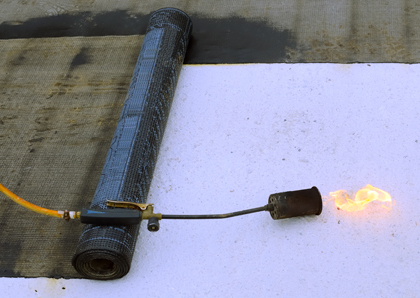 Depending on the polymer used, Modified Bitumen Roof Systems can vary in the way they are installed in a roof. One type of polymer that is usually combined with cold adhesives or hot asphalt is SBS. This material provides bitumen with rubber-like qualities. A thermoplastic polymer often installed when the torch method is used is APP. A thorough assessment of your roof will be done in order to determine the best application approach for your facility.